Turnover in the Turkish pharmaceuticals sector is expected to grow in 2018, supported by price hikes passed by the government in 2017 and early 2018. Therefore, profit margins of businesses are expected to increase this year. Competition in the pharmaceutical sector is not overly high as the market is well regulated (all prices and margins are set by the government). 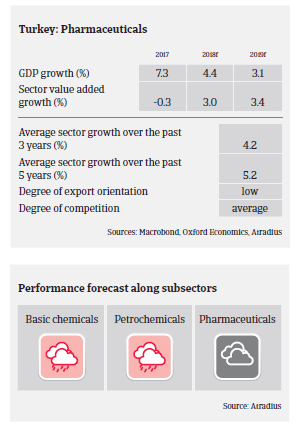 Among other subsectors the basic chemicals segment has been impacted by a slowdown in construction activity, less demand from plastics and textiles buyers and economic volatility ahead of the June 2018 general elections. Margin deterioration cannot be ruled out, as the import-dependent chemicals sector has been affected by the sharp Lira depreciation against the Euro and the USD. Most impacted by commodity price volatility and currency volatility is the oil-dependent petrochemical sector. In contrast to pharmaceutical businesses, many chemical companies are holding bank loans in foreign currency, making them susceptible to foreign exchange risks. On average, payments in the Turkish pharmaceuticals sector take between 90 days and 120 days, in the chemicals sector the range is 100 days to 180 days. As the Turkish Social Security Institution (SSI) is the main customer of the pharmaceuticals sector with a share of about 90%, non-payment risk is muted. That said, in 2018 both non-payment notifications and insolvencies are expected to increase in the chemicals sector, as lower sales and lira depreciation since the end of 2017 negatively affect the liquidity of businesses and their payment behaviour. Pressure on the financial strength of chemical businesses is exacerbated by several interest increases to combat inflation leading to higher borrowing costs, while banks are generally reluctant to lend to the chemicals industry. Our underwriting stance for pharmaceuticals remains neutral for the time being, due to persistent growth and increased profitability, triggered by recent price increases. However, due to public price regulation there is the potential risk that the government lowers purchasing prices in order to reduce budget expenditures. Due to the current issues, our underwriting stance for all chemicals subsectors has generally turned to restrictive, unless buyers are part of a big group and/or provide their most recent financial information.